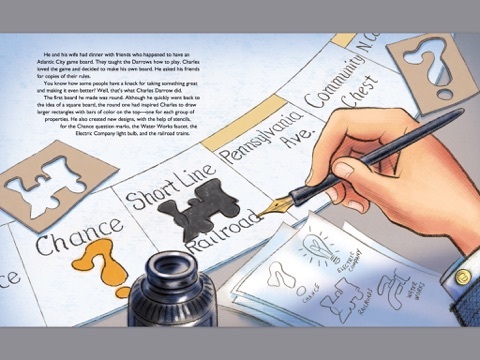 Summary: The history of one of the world’s most famous board games isn’t a straightforward one. The earliest form of Monopoly was a game called the Landlord’s Game, created in 1903 by a woman named Lizzie Magie who wanted to show the injustice of landlord-tenant relationships. Her game had dice, a bank, two kinds of cards called Luxury and Legacy, four railroads, and 22 properties on lots with purchase prices and rents. The game caught on, although an effort by Magie to sell it to Parker Brothers failed, and the properties were named after Atlantic City, NJ landmarks by a teacher in 1930. During the Great Depression, a man named Charles Darrow, out of work, redesigned the Atlantic City game board and began selling handmade copies from home. Parker Brothers turned him down, too, but when his game became a big seller, they changed their minds. 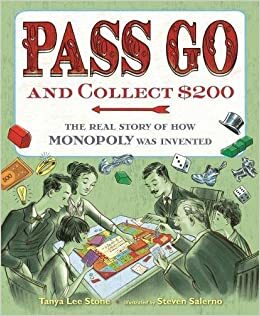 After buying Lizzie Magie’s patent for $500, Charles Darrow and Parker Brothers went on to make millions with the game of Monopoly. The author ends with some questions: Did Lizzie Magie make a wrong move? Did Charles Darrow? Whatever the answers, there’s no denying that Monopoly’s a winner for many. Includes Monopoly trivia and math, an author’s note, and a list of sources. 40 pages; grades 2-5. Pros: A remarkably complex history is laid out in an understandable fashion, with illustrations that document the evolution of the game. Cons: Polls done in 2013 and 2017 have resulted in the discontinuation of the classic iron, boot, thimble, and wheelbarrow tokens. I was always particularly fond of the thimble.